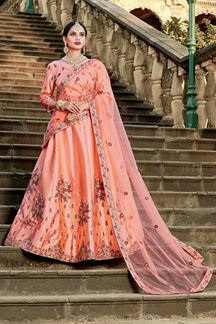 Sizzle & shine wearing this enchanting peach designer lehenga choli set featuring same lehenga & choli with a resham & zari worked motif dominating the centre of bodice, leaving the lehenga falling plain in a classy show! This lehenga choli set is accompanied with contrasting grey front open long jacket embroidered in resham & zari work. Note: Color may slightly vary due to digital photography.